McKinney Possum Removal from A All Animal Control of Collin County is common and we get a lot of complaints about opossums from homeowners and businesses in the cities of Allen, Frisco, McKinney, Plano, Richardson, Wylie, Murphy, TX. Opossum control and removal needs to be started as soon as they have been discovered living in your attic, crawlspace, house, or business. Call your local A All Animal Control of Collin County Wildlife Professional before the problem gets out of hand at 972-895-7661. Is your kitchen being raided at night or are your cats eating more than usual? It’s likely that you have an opossum or opossums living in your chimney or other area accessible to the kitchen. A possible sign that there is an opossum in your attic is thumping sounds coming from above the ceiling. Opossums are normally louder than rats and mice, but not as loud as raccoons. You may also hear hissing. A roof inspection will often reveal spaces big enough for an opossum to fit through. Collin County Opossum removal and Possum Control should only be attempted by those knowledgeable of the habits of these animals. For instance, amateurs are often unaware that opossums will frequently choose an attic for the purpose of raising their young and if they do manage to trap the mama opossum the babies are left to die and decay in the attic. Your local wildlife professional at A All Animal Control of Collin County knows this and will be able to handle your opossum problem in the quickest and most humane way possible. 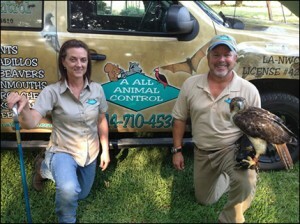 Removing a dead opossum from your yard or home and deodorizing the area is another service we provide. A dead opossum needs to be removed as soon as possible. Leaving a dead opossum is unsightly and will only make the problem worse by attracting other animals and insects. All of these cities in Texas experience opossum control and removal problems. A All Animal Control of Collin County is your local professional that can get rid of your opossum problem the quickest and most humane way possible.